On Tuesday 26th August the AFL held an International Forum for international footy stakeholders. Convened in the Legends Room at the MCG, the day ran for about four hours and included at least two representatives from each participant country at the International Cup, as well as other people involved in football and multicultural issues. worldfootynews.com was fortunate to have two representatives involved (Troy Thompson and myself) - we ensured we were primarily observers but our thoughts were also welcomed when the representatives broke into smaller groups. The day was facilitated by the AFL's Travis Jackson, who in 2007 spent time working with AFL South Africa in the province of KwaZulu-Natal. In this article we'll briefly discuss some of the issues raised. Sash Herceg discussed his role as a football development officer servicing the Western Metropolitan Region of Melbourne, in particular newly arrived communities. As part of his role he often liaises with the Western Region Football League (WRFL). Recently a lot of young African immigrants have been introduced to footy, some showing great athleticism, and already the Western Jets, one of the elite under 18 teams in the TAC Cup have recruited some of the young men. We followed up with Sash Herceg to get some more details. "Every year we (AFL Multicultural Program, Western Bulldogs and the Western Jets) hold the Multicultural Cup for Secondary Schools in the West. Only students who have arrived to Australia in the last 5 years are eligible to play and the main aim of the event is to identify talented players. These players are then invited to the Western Jets Development Squad". As such, Herceg was also heavily involved with the Team Africa side that competed as an adjunct to the International Cup. Herceg's name may be familiar to some of our readers - originally from Croatia, he spent time a few years ago trying to get the game going there (see Croatian Converts hope to bring Footy to the Balkans). Each nation represented gave a short presentation on how the game is positioned in their country and the issues facing them. Although there are many challenges in common, there were also differences. Ireland were forthright that their league faced enormous difficulties growing the code in the face of discontent with the number of Gaelic players being recruited by AFL clubs. The Indian delegation explained that access to ovals in the cricket-obsessed nation was not as easy as one may think, with cricket using them for 7 months of the year, soccer getting a go for 3 months, and currently only a 2 month window remaining for Australian footy. So far their program has begun in West Bengal and two nearby states, but they hope to push into the northern states where the typical physique is taller and stronger. There was also a presentation by Dr Mark Cloney from the Barassi Youth Tournament, expressing their desire to see the event continue as the premier international youth Australian football tournament in some form, be it in Canberra (their strong preference) or elsewhere (pushed by several other delegates). He discussed the ability to tailor local sides to meet the level of participating nations, i.e. in the short term it need not be an elite competition, just an avenue for international junior sides to meet similar strength opposition. Michael Sholly and Nick Bourke were there representing the Amateur Australian Football Council and the Victorian Amateur Football Association. They gave a presentation on their desire to be more involved in international development, offering the services of representative teams to tour. This seemed to be of great interest to several countries, although they were quick to point out that most would be in no position to take on a full strength All-Australian side, even if it was under 23. The Irish suggested a match be played against them when the AAFC team tours Ireland playing International Rules. Incidently that's something that worldfootynews.com suggested to the AAFC several years ago and is an example of how these ideas need to be worked on and followed through over time before they become reality. Brian Dixon also spoke on the relationship with Victorian amateur sides and the great potential there - something that has begun to be harnessed through teams such as Box Hill North (Japan), Bacchus Marsh (PNG) and other relationships forged in recent years. Other topics included ways to encourage AFL club "buy-in" on international footy, the Irish exclusion from the international scholarship list (the AFL conceding it is due to their relationship with the GAA), how that scheme will work, commercial opportunities, the important links between health programs and Australian football, where future International Cups could or should be held, the need for more free to air TV exposure in other countries, funding and sustainable growth, and the frequency of International Cups (3 or 4 years, the possibility of regional qualifiers - probably unlikely). AFL General Manager of National and International Development, David Matthews, spoke enthusiastically about the game's growth. worldfootynews.com has long been of the view that Matthews doesn't just talk the talk but is the international game's best ally in bringing on board the wider footy community. 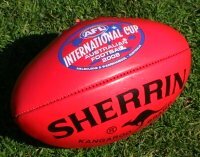 Perhaps the best news of the day was delivered by Matthews, as he announced that the Australian Government had declared Australian football an export product, therefore, hopefully, making it eligible for tax concessions. It's very early days yet, but this was just one sign of a rapidly growing relationship between the AFL, the Government and business, to use football as a tool to do business overseas, and that looks like being a real winner for international footy. Federal Minister for Trade, Simon Crean, was flagged as speaking on the topic at the IC08 Official Dinner the following week, which indeed he did. Matthews also spoke of the IC captains press conference and how they spent a lot of time with the AFL Commission who were impressed by the group of international ambassadors. The implication was that the Commission continues to grow in their enthusiasm for the sport's spread. There's no doubt that with so many issues across a diverse spectrum of international footy that four hours was about a week short of the time needed to thrash out all the topics. Fuller discussions will continue over time, the day was more a chance for the many delegates to be in the one room to get a snapshot of what the others felt were the big issues. Overall it seemed to be a very positive meeting - no massive announcements or breakthroughs - but a good discussion and from the point of view of worldfootynews.com it was interesting to see the interaction between all the various parties and confirm that the major issues expressed to us in the past are indeed what is discussed once the country reps have the AFL's ear. More time would have been welcome, and follow-up action is vital if such meetings are to mean anything, but the atmosphere was one of enthusiasm and optimism and the international game appears to be heading in the right direction. Ideally all working in together would be best. The ammos providing exchange programs and touring teams of appropriate level, the AFL supplying some corporate clout / contacts, occasional elite exhibition games (preferably NAB Cup or main season) and pathways for elite juniors. The wheels are slowly turning, it's a matter of getting these things bedded down and regular so they don't disappear when there's a change of staff or whatever. Your interview on Day 2 of the US Nats with the guy from WA was very encouraging. That's very interesting. I don't know enough about trade and finance to understand that fully. re. the Ammos. For some time yet, they offer a perfect resource - especially at lower levels - of footy for fun, a perfect environment for travelling 'internationals' to develop a network and drop by to train for a few weeks and perhaps play in the magoos. I still hope to instigate some form of (at least initially) VAFA D3/D4 '9s' style lightning premiership - - something that could slot into the international calender of '9s' tournaments - and perhaps in between IC's, that a Euro, or Asian, or Nth Amer squad might jet into Australia for a run at such a tournament.